We are glad to add two Indian American teens – Malika Rawal and Simran Bhargava – to our ever-growing community of young Indian achievers. 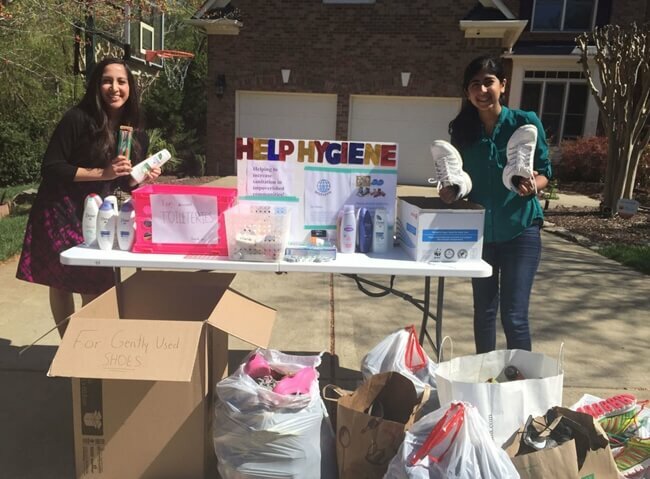 15-year-old Malika and 14-year-old Simran from the Indian community of Charlotte in North Carolina are on a mission to improve sanitation standards in economically disadvantaged communities. Charlotte-based Simran Bhargava and Malika Rawal are among the few young Indian Americans who have gone extra miles to make their humanitarian initiatives permanent missions by founding non-profit organizations to help underprivileged groups and impoverished communities with basic needs. Malika and Simran co-founded HelpHygiene to accomplish their mission of educating people on sanitation and raise funds to eradicate sanitation crisis in backward areas. They have raised $6000 and collected 1200 toiletry items over the past seven months, an initial step towards their mission. Even the other members of the Help Hygiene Foundation, who are directly or indirectly associated with the mission, are conducting fund collection and sanitary education drives. The fund is utilized to support campaigns on sanitation education and buy bedding and shoes for the underprivileged. The seeds of HelpHygiene were sown into the mind of Malika Rawal, on her first trip to Delhi, India. While exploring slum areas in and around the capital of India, she met with a grim reality to her utter surprise. She came across kids wearing only undergarments and walking in the dirt without shoes. She found many families with ‘devastating living standards.’ Water, a most basic need of life, is an unaffordable luxury for them. On return to Charlotte from Delhi, Malika shared her unpleasant experience with Simran Bhargava and proposed the idea of creating a non-profit foundation to her. Simran took interest in it because she too had witnessed repulsive pictures of poor sanitation in poverty-ridden areas during her visits to India. They joined hands to make a difference in the lives of those suffering from consequences of poor sanitation, which resulted in the foundation of HelpHygiene. 9th grader Malika Rawal and 8th grader Simran Bhargava are planning a trip to India during the Christmas Holiday this year end, in order to visit pre-schools in the economically disadvantaged areas of Delhi, educate the students and their families on the importance of sanitation, and supply them with toiletries and other stuff for hygiene in day-to-day life. The founders of HelpHygiene conduct membership drives from time to time. The first such drive was conducted on June 11 in Charlotte, and 30 new members joined the mission of HelpHygiene. The second membership drive is scheduled to take place on August 7. Those who are interested in the humanitarian goals of HelpHygiene in Charlotte can catch up with Malika and Simran online at 6 PM on Wednesdays. Travel Beats is an Indian American community portal by Indian Eagle, a leading international travel organization. We celebrate the achievements of young Indians and publish the Indian Diaspora news besides sharing updates on air travel, India tourism, US visa and immigration. Impressed by your work at such an young age.